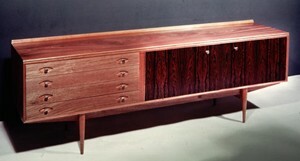 G-plan defined modern furniture from the 1950s to the 1970s. Stag's Minstrel range was one of the most successful furniture ranges of all time. Stag also made some cool modern designs. Ercol brought a modern take on traditional furniture. Nathan made some great modern furniture in the 1960s and more traditional designs in the 1970s. The Parker Knoll brand always represented quality and comfort, but embraced modern design in the 1950s and 1960s. Younger was high quality furniture and taste leading design. Archie Shine produced some of the highest quality modern furniture. Schreiber brought mass market production techniques to the furniture industry. Uniflex made some stunning modern furniture in the 1960s. Scandinavian furniture was the inspiration for British design in the 1950s and 1960s.